Testing scores from the 2013-2014 school year have been released for schools statewide. I've pulled the results for the 3rd District from the Courier-Journal's online database and included them below. These scores represent a whole lot of effort and study from our students, but they couldn't perform at these levels without the hard work and tireless dedication of our teachers — thank those you know or see today! 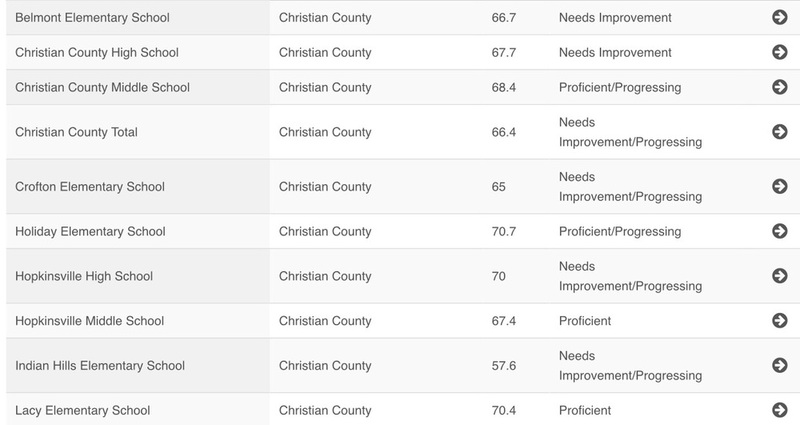 Click here (http://datacenter.courier-journal.com/projects/2014-kentucky-public-school-test-results/?sf31899164=1) for the C-J data center to search for another county, or compare various counties. Under the Unbridled Learning review, schools receive an overall score of 1-100 based on their achievement in key areas. They then receive a percentile rank among elementary, middle and high schools statewide. They are also judged on whether they met their goal score and receive a classification status — Needs Improvement, Proficient or Distinguished — and whether they are progressing.